Once in a while, a nonfiction book gets as much buzz as its fictional counterparts. 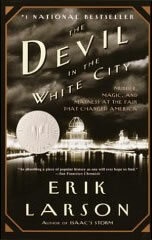 Erik Larson’s The Devil in the White City became a national bestseller and won the Edgar Award for Best Fact Crime. These accolades are well-deserved. Larson masterfully weaves the overarching history of Chicago as it fights for respect alongside the dedicated dreamers and craftsmen attempting the seemingly impossible task of designing and building The World’s Fair in just a few short years. The stakes for our characters couldn’t be higher. Everything that could possibly go wrong with the planning and construction of the fair does go wrong. People die, supplies don’t come in, nothing is completed on schedule and the Chicago cold and rain fights them every step of the way. Architects Daniel Burnham and John Root are selected to oversee the construction of ‘The White City,’ as the fair becomes known. Not only are their reputations on the line, but they must represent their city in the shadow of New York City and the site of the previous fair, Paris. The novel switches between Burnham and the Fair and the more sinister story of H.H. Holmes, a man who murdered at least nine people during the same time period. This part of the story is creepy and enthralling. It’s like the part of the horror movie where you scream at the people onscreen not to go into the basement. You know that Holmes is going to murder the naïve women he lures into his hotel, but they do not. It really opens your eyes to the differences and similarities between law enforcement and justice in the past and the present. Disappearances of people who were undesirable or marginal were largely ignored. This section reads like a very taut murder mystery. The fact that it is true only makes it more horrific. While this book is mostly about men, there are some amazing snippets about women. The best one involves a female architect (the only one involved with the fair!) who spends years designing a building only to be run out by a committee of women with their own ideas about decoration. She is quietly escorted to a sanatorium to deal with her mental breakdown. Mr. Larson writes history really well – he understands the tension between the individual and the collective history and reflects them in his writing. I wish students who say they hate history could read books like this. History is alive and fascinating and dare I say, even funny! The wit is dry but oh so wonderful. The Devil in the White City is a great read. “After all, this was a world’s fair, and fairs should be fun.” History should be fun too – and it can be, in the right hands. Get thee to a bookstore pronto and see for yourself.